Gluten Free Cutout Sugar Cookies - Soft and Tender Cookies for Celebrating! 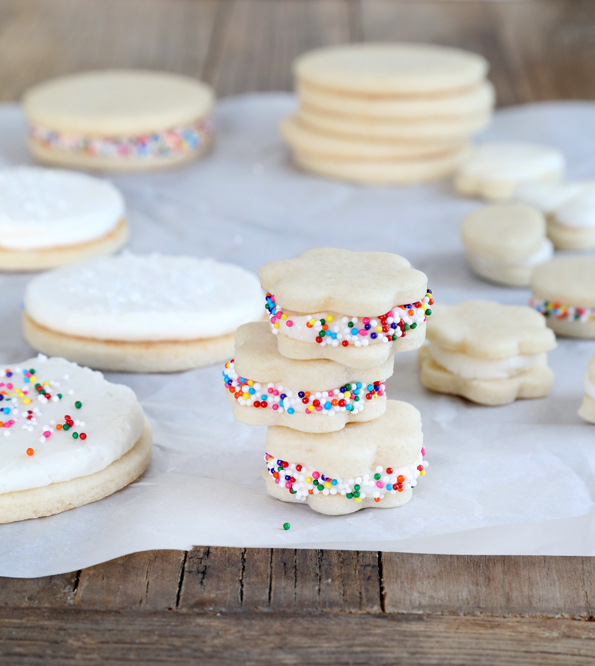 These soft gluten free cutout sugar cookies with a meringue-type frosting are in a class by themselves. They’ll hold any shape you like! I might just be there for some bananas, lettuce and maybe an avocado, some spices and, say, some rice and beans. You know, exciting stuff. But those cookies are right there, right as you walk in. I know what sort of foods are good for me and my family. I know those sugar cookies do not qualify as healthy. But there’s just something about biting into that impossibly soft sugar cookie with the thick icing that says celebrate! Every holiday and every season needs its own cookie: St. Patrick’s Day, Easter, Spring celebrations, Christmas, New Year’s, Valentine’s Day… Need I go on? We all need a cookie that can hold its shape, for crying out loud! Now as much as I love the idea of just picking up a package of those cookies from the front of the grocery store and going on my way, that’s just not in the gluten free cards for us. But that’s really more than okay! Here’s why. 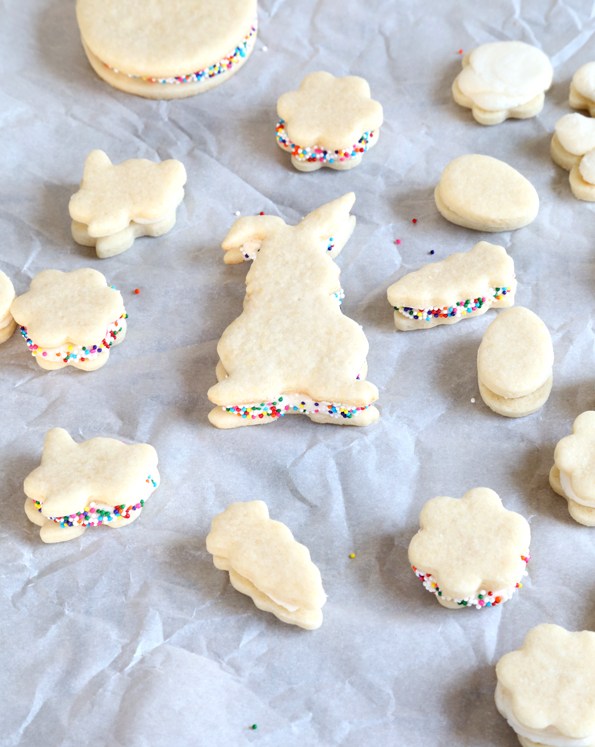 These gluten free cutout sugar cookies are seriously so easy to make from scratch. The dough has very few ingredients so it comes together very quickly. It’s super simple to roll out, and stable enough that it’s even simple to cut out shapes and transfer them to the baking sheet. There is nothing fragile about this recipe. But once you bake the cookies, they’re tender and light as could be. I just had to make a video to show you exactly how easy it is to make these simple cutout sugar cookies. Seeing is believing! A quick word about the frosting: this frosting recipe is super super thick. It’s not what I would generally use to frost cupcakes. And it’s very stable, thanks to the meringue powder. That means that if you wanted to travel with these, they could handle it. If you don’t have meringue powder, just skip it. The frosting will just be a bit softer. If you ever want to celebrate just a little bit, you can always cut this cookie dough into miniature shapes. Have a look at that “X” for yourself! When I said this gluten free cutout sugar cookie dough would hold any shape, I really meant it. You can of course add some food coloring to the frosting (I encourage it! ), but use gel coloring or it will really alter the moisture balance and make the frosting soft and weepy. That’s exactly what we are trying to avoid. I left out the coloring here because, to be honest, the anti-food-coloring people scare the devil out of me. According to some of the unsolicited emails I get, contrary to popular belief, it is not, in fact, a free country. In a large bowl, place the flour, xanthan gum, baking powder, salt, granulated sugar and confectioners’ sugar and whisk to combine well. Add the butter, egg and vanilla, and mix to combine. The dough will be thick and relatively stiff, and you may need to squeeze it together with your hands to bring all of it together. Roll the dough between two sheets of unbleached parchment paper into a round a bit less than 1/3-inch thick. Using a 2 1/2-inch round cookie cutter, cut out rounds of dough and place them about 1-inch apart on the prepared baking sheets. Place the baking sheet in the center of the preheated oven and bake until just set, about 6 to 8 minutes, depending upon size. The edges of some of the cookies may brown slightly. Take them out before there is any significant browning. Remove the cookies from the oven and allow them to cool until set. Transfer to a wire rack to cool completely. While the cookies are cooling, make the frosting. In the bowl of your stand mixer fitted with the paddle attachment, place the butter, milk and vanilla, and mix on medium speed until combined. Turn the speed up to high and mix until creamy. Add the salt, meringue powder and about 3 1/2 cups of confectioners’ sugar. Mix slowly until the sugar is incorporated. Turn the mixer up to high and beat until it becomes uniformly thick. Add the rest of the confectioners’ sugar if necessary to thicken the frosting. Once the cookies are completely cool, pipe or spoon a generous amount of frosting onto the top of each, and spread into an even layer with a wide knife or offset spatula. Scatter sprinkles, if desired. Allow to set at room temperature until the frosting hardens a bit. Store any leftovers in an airtight container at room temperature. Originally posted on the blog in 2012. Recipe unchanged, photos mostly original, video new. Does making the dough & freezing it until ready to bake cookies affect the texture, etc? As long as you wrap the dough very tightly and prevent any air at all from getting into the container, you should be able to freeze the cookie dough raw, Susan. But honestly I wouldn’t recommend it. It’s so easy to make, I would recommend making it fresh. If the dough dries out at all, you won’t be able to roll it. Long time follower. Thank you for all your recipes. I have done several and you are amazing! I have two questions for you. Can you use egg whites instead of meringue powder? And you use a butter substitute? And for a butter substitute, I would try Spectrum nonhydrogenated vegetable shortening in butter flavor (by weight). Earth Balance has way too much moisture and the cookies would likely not hold their shape. Hope that helps! One of our favorite cookies! One of the easiest GF cookies I have made. Will use this recipe over and over. Dipped mine in melted chocolate. Made the cookies today, Tim ate FOUR in one sitting! Made my teeth hurt just watching him. He was quite happy, and I am sure he will have more for breakfast. They are so delicious, just like I remember, you are a genius! Four of these cookies, frosting and all, is like an extreme sport, Anneke! If anyone can do it, a teenage boy can, though. So glad you liked them. See – you can make cookies! I made these today and my friend who is Celiac had them. She said that they were BETTER than what she remembers those store bought cookies to be. Really, it was a Meg Ryan moment. I thought I should leave the room because she was so excited. Not Kidding! These look awesome! Thanks for sharing the recipe….these will make perfect pumpkins! 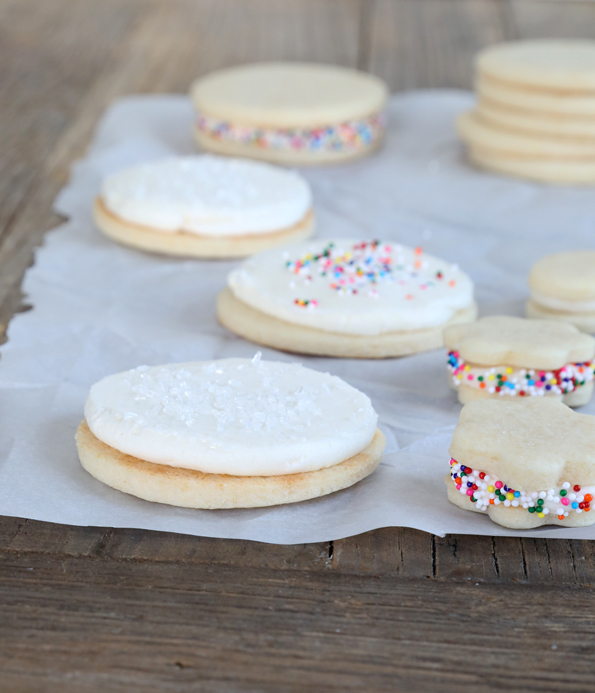 Just out of curiosity, how do these compare to the sugar cookies in your first cookbook? That recipe is a favorite and has earned lots of praise and many doubts that they were really gluten free cookies! Hi, Stacy, That’s a great question. That recipe is a more traditional sugar cookie, lightly browned and chewier. These are pillow-soft, thicker and melt in your mouth in a way that is a bit reminiscent of butter cookies (in texture). Personally, I think you need both recipes! And the one in the book is much better for decorating cookies with royal icing. This one is too soft for detail work. Ok, thanks! I agree, the cookbook cookies are great for decorating and made a perfect welcome home treat last week for my sis and new nephew:). I made these yesterday and they are soooo good! My son loved them. I loved the idea of rolling the dough between the parchment paper. It worked great. Be still my heart! Thank you Nicole. Cookie on my most wanted list. And yes, I read the part about a cookie book…………..hot dang! And, and………..a bread cookbook 12/13. You Go Girl!! Thanks, Patti! The clone book is still just a thought, not pitched yet to the publisher. But it’s deep in my heart. :) The bread book is underway already! Love the idea of the clone book and of course the bread book! I made these last night for my kiddos (and for my husband to have for breakfast, just don’t tell the kids) they are fantastic! I love the at the dough does not need to be refrigerated, and the cookies hold their shape with minimal to no spreading, perfect for all of the upcoming sugary holidays! I won’t tell. I don’t dime, Lauren. I live in a glass house. ;) These are very good for the upcoming sugary holidays! We’re dye-free too because my son has varying degrees of almost psycho reactions to them. India tree makes vegetable based dyes and most recently a sugar dyed the same way. You can buy them on Amazon. There will be sticker shock, but keep them in the fridge and they last much longer. You can’t make ever color, but at least everything doesn’t have to be white. Caramel color doesn’t bother my son, so we can use things with that. Also, I’ve noticed that you’ll get a pretty intense blue from dehydrated blueberries (powdered with smashing). Any fruit that has intense color is probably pretty similar. Pay attention to which fruit dye your fingers. Those are the ones you want. Oh, Nicole, I know those cookies of which you speak – I run my daughter by them quickly when we are in the grocery store so she doesn’t get sad that she can’t eat them. They are so alluring with their puffy white domes covered in unnaturally bright icing, often color coded by season or holiday. So THANK YOU for this awesome looking recipe. Yet – your conundrum, is totally valid! I have been wondering how you handle the whole recipe-a-day thingie versus publishing cookbooks. It’s kind of insanely amazing and generous of you to give us so many recipes for FREE when it’s your job to um, not really do that, at least not all the time. Maybe because I used to work in book publishing, or maybe because I’d like to write my own (fiction) book some day, that I really do understand what you’re saying, and my two cents is, do what you need to do and I’ll still be here, reading whatever you feel like writing, clone recipes or not. Once again you have come to save the day! I was thinking of making a 45 min drive to gluten free bakery to get soft frosted sugar cookies for Camden today….low and behold you post this! (insert claps and cheers). I can’t make them today (missing one ingredient) but I will be whipping some up tomorrow! Thanks!!! Need to get more gf flour so I can be a hero and make these cookies! YUM! Dewd, really? Jordan asks me about those crazy pink frosted cookies A LOT. Now they have orange frosted ones with black sprinkles for Halloween. I could reach across all the States that separate us and kiss you. I need to figure out where to buy meringue powder cuz I want them to be like yours. You mentioned your hair flying behind you and I laughed. Isn’t that a picture of all of us working moms in general? And isn’t your hair pretty short? I think I may need to see a re-enactment, lol. meringue powder is usually in the wilton section at hobby lobby…small can. @ Candaceiw hahaha. My son would laugh so hard if I told him what a dude is and then he would use the word more. I am coastal in California so dude is a righteous surfer looking for some tasty waves. Annoying as all get out actually. Wow, I need to see that! I am a dye free person but not one one of the crazies I promise! I really appreciate you posting the pics without the dye because my daughter can’t have it. She has an equally and sometimes worse response to dye then she does gluten. It will be nice to make these with her and not have her “wanting” the ones on the blog instead of mine because they aren’t colored. How do you think the c4c clone would work here? I only ask because I mixed a bunch of it to make pasty crust and I have a lot left. I’m guessing fluffier cookie? Kristy, I am going to jump in here because I use the C4C mock for almost everything (not quite everything). That is just my personal preference. However, usually something like this recipe that is very specific (clone), I usually follow the recipe as written. Then if I think it will hold up with the mock, I go from there based on my own personal preferences. I hope that helps. I had considered using my mock C4C, but like Kristi said, I would try to start with Better Batter, if you have it. But if you don’t, and you don’t need the cookies for a beauty contest or anything, give it a whirl. I think it might just be too starchy, and too low in xanthan gum which would make the cookies really fragile, but it’s worth a shot! Thanks for jumping in, kclark! Perfect timing! I am making cut outs for the hayride this weekend…I’ll make them in leaf shapes, though. Thank you THANK YOU!!!! I am so excited to see this recipe! Thank you for taking the time to create it. And while I love all the recipes you post here (and I look forward to seeing photos of your wonderful creations every day) I understand that there is only one of you. If limiting the posts here allows you to create more recipes for books, I understand. Thank you for your understanding, Margaret! And it would just be a time limit, if anything, for the free recipe remaining on the blog. Not limiting new posts, and not all recipes would be time-limited. I couldn’t help it. I already made them. But I did make one tiny change. It’s a secret (not so secret now) ingredient that I have always added to sugar cookies. I added 1/2 teaspoon almond flavoring. And let me tell you this. If I had kids around today (which I don’t) they would already be gone. Gone as in zip, nada, zero. As it is, my husband and I will have to endure and find a way to eat them or share them or somehow get rid of them. Hmmm….I don’t think it will take very long to find takers. So simple! So good! Thank you, thank you! Dee, I’m not talking about stopping the blog. I’m just talking about potentially having some recipes be up on the blog for a limited period of time. I’m very sensitive to others’ limited means (after all, this is a blog about doing GF on a shoestring! ), but publishing free recipes is a very, very expensive proposition for me. I may have to create limits, that’s all. Okay, so you can’t hear him (possibly because he has been at school for a couple of hours already, and doesn’t know this recipe is on the blog), but my son is screaming, cheering, and leaping around the house in complete and utter joy about this post. Seriously. These are his most favoritest cookies EVER. He looks at those packages in the store with the pitiful puppydog face that so makes me want to buy them, but I won’t, even though I really, really want to do it for him. I once paid GF bakery prices for these babies, because the puppy face got to me, but this is sooooo much better! I know that you are supposed to be my best friend, but my son (Tim, by the way) has just stolen you away from me so that you can be his best friend and make cookies for him everyday. Although, if I can pull off making these for him (let’s remember my past cookie baking issues), maybe he will be my best friend, too. Are we supposed to be best friends with our teenagers? I don’t think so, but these cookies will change the whole scope of my parenting future! Well, ’cause they are cookies? And I am not good with cookies? You are so right, I must have complete faith in my son’s best friend, Nicole, who can do anything! Usually, I don’t know that I need the recipe until you post it, then I need it RIGHT NOW! Like these cookies. Yum. These look delicious! If anyone tries to make these using sugar and dairy substitutions please post your results. Thanks for posting this with plenty of time before Christmas!